If you follow me on Facebook or heard me preach a couple of weeks ago, you know how moved I was by my first trip to Israel. Standing where the prophets walked, praying where Jesus stood, seeing the fields where first David and later the Christmas shepherds tended flocks—it was an experience I’ll never forget. But meeting residents of Israel and Palestine—Jews, Muslims, and Christians, eating and talking with them in their homes and other informal settings—had the most profound impact on me. In this post I want to tell you what I learned from one of them. Sami Awad is a Christian Palestinian peace leader. In 1998 he founded the Holy Land Trust, a nonprofit organization located in Bethlehem, with the mission to seek “peace and justice for all peoples, and to relate to each other with empathy, compassion, trust and respect.” As executive director of the Trust, he works daily for nonviolent solutions to the Israeli-Palestinian conflict that continues to cause trauma in this troubled land. This remarkable man summarized his passion for peace by using four verbs that characterized the ministry of Jesus. These are critical not only to peace in Israel and Palestine, but to us in our context of peace keeping here. Jesus was often on the go. He went where the people were. He stopped to see them as they were, to discover their needs, and to listen to their stories. “Just tell me your story,” Sami responded, and he simply listened for a long time. At the end of the meeting , the radical told him, “No Palestinian has ever been so kind to me.” And today the men are friends and continue to work towards peace. “This wouldn’t have happened if I had not been willing to cross the line from Gaza (the place where Palestinians are restricted) into Israel,” Sami told me. Just as Jesus crossed the cultural barriers to travel through Samaria (the land of half-breed Jews that most Jews avoided), our pursuit of peace always begins with a willingness to walk toward our enemies instead of fearing them. Jesus healed whole persons, not just their physical maladies but also their emotional and spiritual brokenness. Jesus healed even those who wanted to kill him. “I could get angry and perpetuate the Israeli-Palestinian conflict out of my anger,” Sami told me. 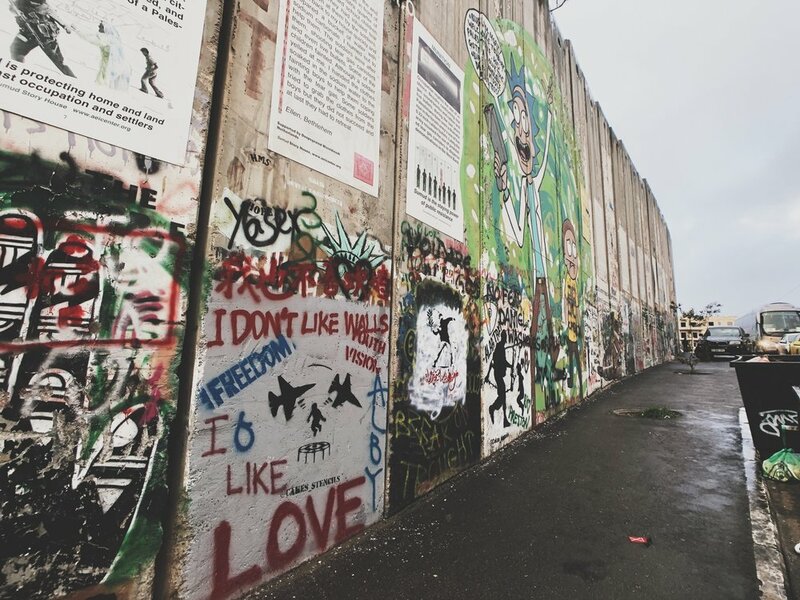 “But as a Palestinian Christian, I decided I’d be a healer of trauma, not a perpetuator of it.” He reminded me that it’s easy to dehumanize an enemy, but when you see people who are hurting, you work to bring healing. 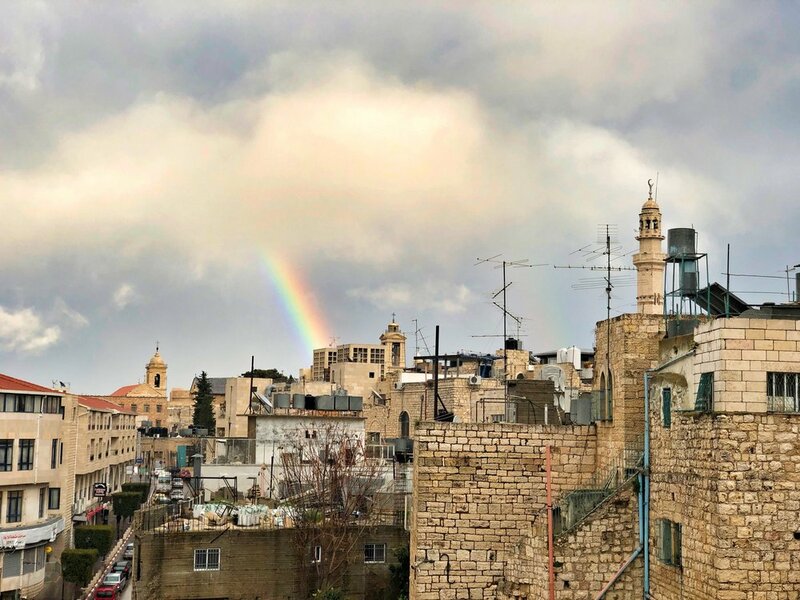 Rainbow over Bethlehem as we left Sami Awad’s place. “Proclaim the kingdom and the kingdom only,” Sami says. “Proclaim the gospel and the gospel only.” Jesus didn’t get wrapped up in political arguments. “Render unto Caesar what is Caesar’s and unto God what is God’s,” he said. Some want to portray the Israeli-Palestinian strife as a religious conflict. But Sami believes strongly that it is not. It is a political conflict. But politics will not heal the divisions that keep people apart in the Middle East (or in America, either, for that matter). Religion won’t bring people together, either. Only the gospel, only the radical love of Jesus persistently and painfully demonstrated by his followers today can do that. Of all I learned while I was visiting the Holy Land, this is the most important lesson of all. How about you? What are you doing to be a peacekeeper in your culture and context?